Packed with the power of 5 SUPERFOODS, this green smoothie mix is the perfect way to get more greens in your diet. Packed with the power of 5 SUPERFOODS, this green smoothie mix is the perfect way to get more greens in your diet. Concentrated and potent, these highly alkalising superfoods are essential to rebalance pH and cleanse the system. A synergistic blend of African Baobab, Green Grasses, Hemp Seed Protein, African Moringa and Spirulina provide a broad balancing spectrum of essential vibration. 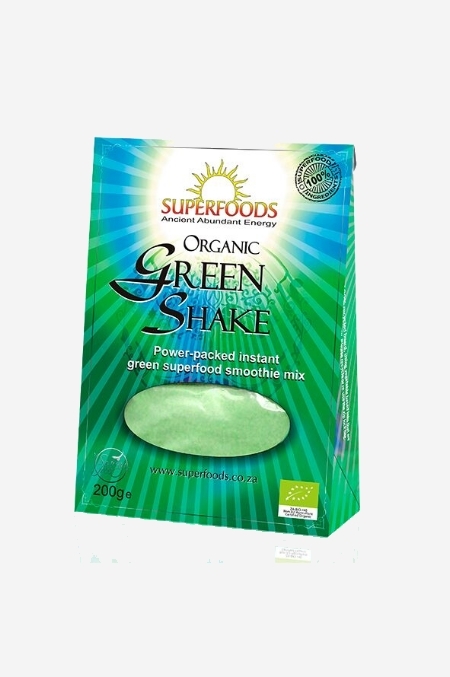 GreenShake tastes green, so if you are new to greens, go sweeter until you get used to the taste. Daily use is recommended to assist with alkalising balance.